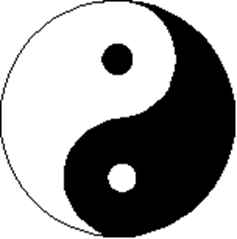 The Yin Yang symbol shown below illustrates the dynamic interplay of our ever changing Energies. It is a continuous swirl and flow from one opposite to the other – hot to cold, wet to dry, light to dark, positive to negative, expansion to contraction and back again. The same interplay of actions and emotions is also constant within our body’s physical, emotional and spiritual processes. For instance we have inhalation/exhalation, eating/excreting, love/hate, happiness/grief and ultimately life/death. Everything that we do can be also is described as being more Yin or more Yang. Running is more Yang than walking; walking is more Yang than standing as standing is more Yang than sitting and so on. The food we eat has the Yin/Yang polarity. Rare cooked red meat is about as Yang as it comes whilst sugar and alcohol are at the Yin end of the scale. This is why wine goes so well with steak. It feels good to those who enjoy steak and wine because it feels like some sort of balance is being made. The balance however is very fragile. Rather like putting two large weights on the opposite end of a sharp fulcrum. For people who are looking to balance Yin and Yang within their diet we reduce the extremes so that it is easier to balance. A good way to do this is to eat more vegetables and short grain brown rice because they are all very centring. Our constitutions are also subject to the Yin and Yang polarities. Physically active people are more Yang than those who live a more sedentary lifestyle. For best health we need to learn how to balance Yin and Yang within our lives and to match our constitution. What we eat, what we do, our exercise, our thoughts and meditations will all affect the Yin and Yang balance. For example, if you were to take part in a meditation retreat which would be a quite Yin activity you would be ill advised to live on a diet of lasagne and sausages. Conversely if you are just about to run a marathon fasting is not exactly the best preparation for the event. The examples given here are deliberately very extreme so that the point is easy to understand. The subtleties of Yin/Yang can be very deep and complex. If our bodies become out of balance it affects us negatively. If we can understand the theory behind Yin and Yang we can stop the imbalance before it happens. Activities such as Tai Chi, Shiatsu, Chi Gung, acupuncture, meditation and Reiki are traditional Eastern approaches that help us to either maintain our inner balance or get it back again if we are starting to lose it. If we can balance the Energies of Yin and Yang within our lives we feel more in tune with ourselves, our community and our environments. We have little to lose and a lot to gain from learning this approach!